The Society has spent 37 years restoring the lighthouse. Our list of projects includes many that were capital intensive, including the Fresnel lens installation and rebuilding the Fog Signal Building. In all cases besides any specific technical expertise we couldn’t source internally, everything we’ve done has been with volunteer labor that not only saved us money we didn’t need to raise, but we believe the work was superior just because we enjoy a wealth of talent available to us in the local area who rally around our local team leaders when needed. 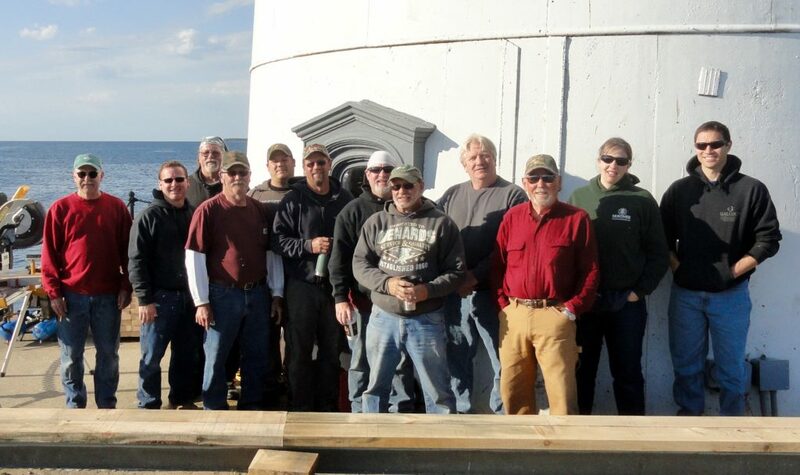 It has been a joy for all of us to honor your funding donations by doing the very best work we can while keeping our costs as low as possible, all while adhering to the best practices of lighthouse restoration. We are nearing the end of a multi year capital restoration program, with this year’s list of projects and then a final year next summer of stripping the white coating and windows of the bulk of the lighthouse tower and recoating it with the same 2 part epoxy Imron you’ll see described later in this document. We will seek grant funding for that project. When we coordinated the rebuilding of the lighthouse base with the US Coast Guard many years back when it was near collapsing we learned that long use life is key when your structure faces the weather extremes all Great Lake Lighthouses endure. Everything we are doing is designed to last a very long time, ideally 50-­‐75 years. We want to leave a legacy to our next generation of stewards the ability to focus on public access and education, not continual capital restoration. We are beginning that transition with the tours and special group visits which we hope to expand on, and our capital raise will shift to operating income and endowment to ensure there will always be funds available for them to work with. You can donate online by clicking on the icon on the left. Or, download the newsletter which contains a form and send it along with a check to our Treasurer, Glen Townley. Mailing instructions are included on the form. Each donor whether an individual, group or family, will be recognized on a sign at the gift shop. Gifts are Deductible: The Harbor Beach Lighthouse Preservation Society, Inc. is a recognized 501 c 3 non profit, and as such all gifts are fully deductible to the maximum extent allowed by law. Questions: We appreciate your continued support of the lighthouse restoration project, and please let one of our campaign co chairs below know if you have any questions or submit your question on line here. We’ll promptly reply. Click here to go directly to the Fog Signal Fundraiser sponsorship opportunities.